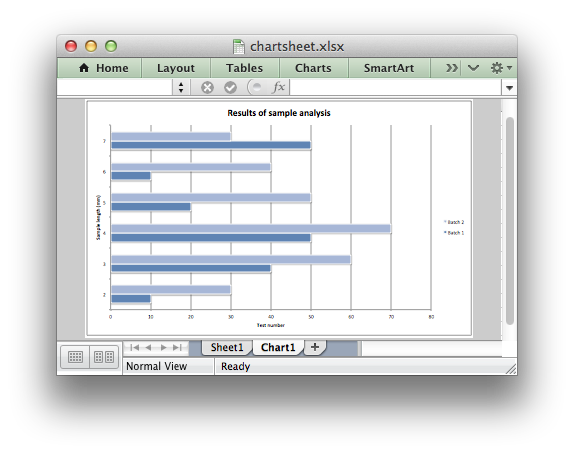 The Chartsheet object represents an Excel chartsheet. It handles operations such as adding a chart and setting the page layout. //... Set up the chart. // Add the chart to the chartsheet. chartsheet Pointer to a lxw_chartsheet instance to be updated. 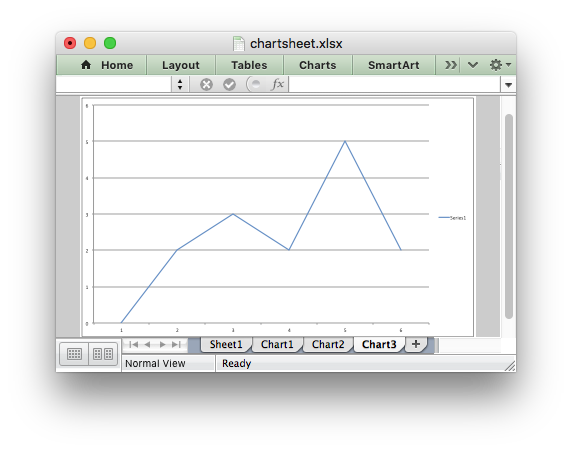 chart A lxw_chart object created via workbook_add_chart(). 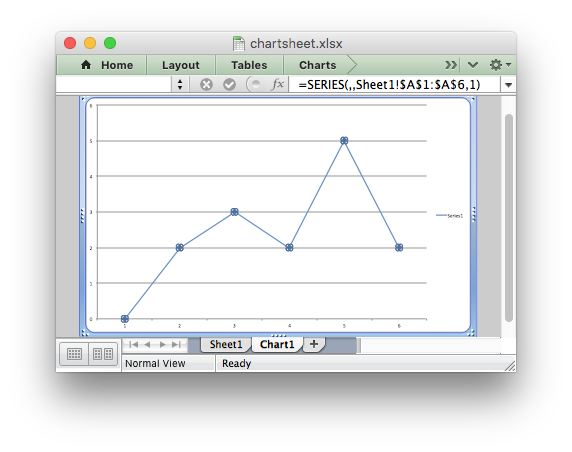 The chartsheet_set_chart() function can be used to insert a chart into a chartsheet. The chart object must be created first using the workbook_add_chart() function and configured using the chart.h functions. // Add a data series to the chart. // Insert the chart into the chartsheet. A chart may only be inserted once into a chartsheet or a worksheet. If several similar charts are required then each one must be created separately. More than one chartsheet can be selected via the chartsheet_select() function, see below, however only one chartsheet can be active. The default active chartsheet is the first chartsheet. A selected chartsheet has its tab highlighted. Selecting chartsheets is a way of grouping them together so that, for example, several chartsheets could be printed in one go. A chartsheet that has been activated via the chartsheet_activate() function will also appear as selected. You may wish to hide a chartsheet in order to avoid confusing a user with intermediate data or calculations. chartsheet_set_first_sheet(chartsheet19); // First visible chartsheet tab. chartsheet_activate(chartsheet20); // First visible chartsheet. This function is not required very often. The default value is the first chartsheet. options Chartsheet elements to protect. Passing a NULL password is the same as turning on protection without a password. Passing a NULL password and NULL options had no effect on chartsheets. 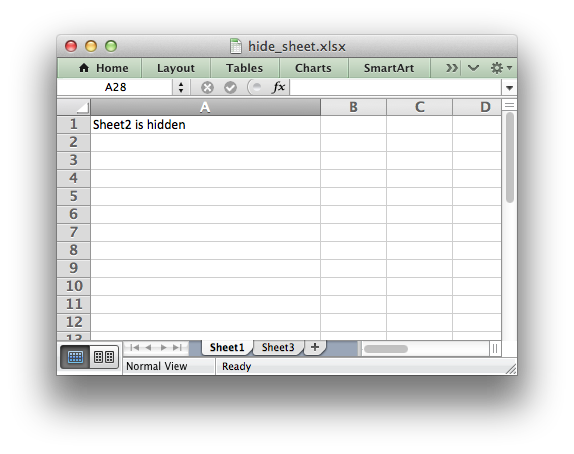 Note: Sheet level passwords in Excel offer very weak protection. They don't encrypt your data and are very easy to deactivate. Full workbook encryption is not supported by libxlsxwriter since it requires a completely different file format. The default zoom factor is 100. It isn't possible to set the zoom to "Selection" because it is calculated by Excel at run-time. paper_type The Excel paper format type. If you do not specify a paper type the chartsheet will print using the printer's default paper style. See worksheet_set_paper() for a full list of available paper sizes. left Left margin in inches. Excel default is 0.7.
right Right margin in inches. Excel default is 0.7.
top Top margin in inches. Excel default is 0.75.
bottom Bottom margin in inches. Excel default is 0.75. The chartsheet_set_margins() function is used to set the margins of the chartsheet when it is printed. The units are in inches. Specifying -1 for any parameter will give the default Excel value as shown above. See worksheet_set_header() for a full explanation of the syntax of Excel's header formatting and control characters. The syntax of this function is the same as chartsheet_set_header(). The syntax of this function is the same as chartsheet_set_header() with an additional parameter to specify options for the header. The syntax of this function is the same as chartsheet_set_header_opt(). The members of the lxw_chartsheet struct aren't modified directly. Instead the chartsheet properties are set by calling the functions shown in chartsheet.h.